Georgina 2 seater power recliner and 2 power recliner chairs. 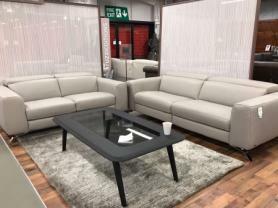 Upholstered in very durable soft grey chenile fabric. Extremely comfortable high back suite offering great lumbar support. We are selling the last of our stock at a crazy price to clear. Sizes 2 seat Length 150 cm. Width 90 cm. Height 96 cm. Approx. Sizes Chair Width 90 cm. Depth 90 cm. Height 96 cm. Approx.